You are here: Home / Beauty & Style / Foods that make your skin look good and your body feel great! Food is not only used for satisfying our hunger. Food has other uses, as well. Among other purposes, food can be used to improve the health and look of our skin. “We are what we eat” is a saying that has some truth to it. The substances that we put in our bodies influence the way the body functions, our health, and the way we look. The food we eat can make our skin “glow”, in a good way. Certain foods can create or lessen dark areas under the eyes. Food can also affect levels of acne. 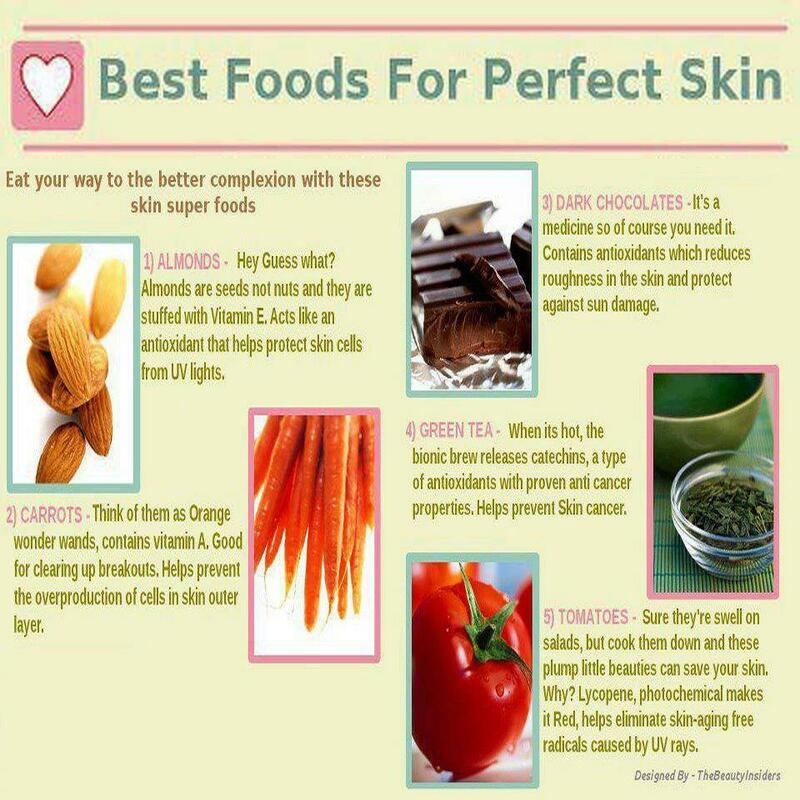 Food can benefit or hinder how smooth our skin is. It can provide anti-aging properties to help prevent or reduce wrinkles. Certain foods can also protect the skin against UV rays from the sun. It is important to love ourselves for our natural beauty rather than try to create a synthetic look to try and meet the pressures and unrealistic images presented in today’s society. Taking care of our bodies by eating healthy and nutritious foods is a great way to reach our personal potentials for living in a body that is naturally beautiful, healthy, and one that we can be confident about. Our look should be based on our own goals for ourselves rather than on pressures from others. So, use the information in this article to fuel your own wellbeing and feel great about who you are. Feel confident about your own beauty because you are uniquely you. 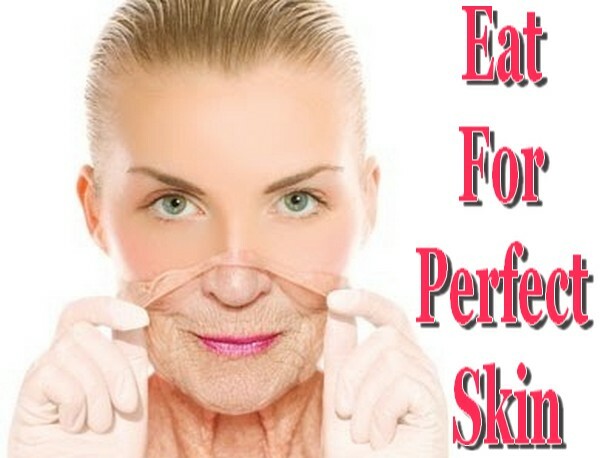 Following is a list of foods that help you to make your skin look great. Eating these foods will not only help your skin, but will help your overall health and wellbeing, as well. Included in each section is a tip on how to make it easier to begin eating each particular food on a regular basis. Radishes have high amounts of Vitamin C, sulfur, and silicon. All of these components work together to strengthen the skin. They also boost collagen and stimulate the circulatory system making your skin look healthier. To incorporate radishes into your daily food intake, try slicing some up and keeping them in a dish in the refrigerator for the week. Grab some for a snack and have them with a veggie dip or eat them on a salad. Some experts say that avocado is one of the healthiest foods you can eat. It is a “power food”, because it holds lots of different vitamins. It has many health benefits. Some examples include maintaining a healthy heart, lowering blood pressure, and improving eye health. Additionally, regarding your skin, avocados have an anti-aging effect and also help create a healthy glow to your skin. To incorporate avocados in your daily food intake, try mashing some up to create guacamole or chop some up and put on salads or eat plain with a dash of salt or soy sauce. Sweet potatoes have tons of Vitamin C which helps the skin stay smooth and reduces wrinkles. According to Tara Green with Natural News, surprisingly, sweet potatoes have 65% of the daily recommended amount of Vitamin C. You could potentially get up to 700% of the daily recommended amount of Vitamin A from sweet potatoes because of how much beta-carotene they have in them which turns to Vitamin A in the body. Vitamin A is great for skin health and anti-aging. For best nutritional value, be sure to eat the skins of sweet potatoes, as well. An easy way to keep sweet potatoes a part of your diet is to keep a bag on hand (they stay good for a while compared to some other produce) and to make mashed sweet potatoes once or twice a week. You could also slice them and make baked or fried sweet potato fries. Actually, Green also states that the beta-carotene will be absorbed better if it is consumed with a small amount of fat, so cooking the sweet potatoes in oil might not be as bad of an idea as you might think (try olive oil or another somewhat healthier oil). Spinach is great for your skin because it could possibly reduce the chances of skin tumors and skin cancer. Spinach helps to strengthen skin by helping it to repair itself and to protect it from antigens. It also helps to keep the skin looking smooth and healthy. Add spinach to your daily food intake by buying a bag of baby spinach and eat it throughout the week. Grab a handful and put dressing, some shredded cheese, and tomatoes (plus whatever other toppings you want) on it for a salad for a meal or as a snack. Add some spinach to scrambled eggs or an omelet. Tomatoes are healthy for you no matter how you eat them, but, when cooked, they have even more nutritional value. Heating tomatoes causes lycopenes to be released. This substance has anti-aging properties to it, because it helps to protect your skin from the harmful effects of ultraviolet rays from the sun. Add tomatoes to your daily diet by slicing them and eating them with salt and pepper or sautéing some for tacos. Carrots are great for the eyes and great for the skin. Carrots help to prevent acne and breakouts of the skin by preventing excessive production of cells on the outer layer of the skin. This is how pores get clogged which leads to breakouts. Eat carrots daily by buying a bag of baby carrots (or whole carrots and cut them up). Throw some on a salad (with spinach, tomatoes, and other foods discussed in this article) or grab a couple as a snack. Pumpkin seeds have wonderful skin-health promoting properties. Pumpkin seeds have zinc which provides the body with great beautifying benefits. Zinc helps the skin to heal and protect itself. It also increases cellular immunity which enhances your body’s ability to stay healthy and fight illness. Pumpkin seeds also have the essential fatty acids including omega 3, omega 6, and omega 9. These seeds can help reduce acne and inflammation from conditions such as dry skin or eczema. Eat pumpkin seeds regularly by grabbing a handful for a snack. Did you know that almonds are not nuts? They are seeds. They are great for the body and the skin because they have plenty of vitamin E, which helps protect the skin from ultraviolet radiation from the sun. It also helps to repair the skin. Eat almonds daily by keeping them nearby so you can grab a few every once in a while. Mmm…chocolate. If you haven’t heard, dark chocolate is actually good for you, in moderation of course. The antioxidants in dark chocolate help to promote smooth skin and also protects the skin from the sun. Have just a few ounces of dark chocolate a day to provide your body with these benefits. I don’t think you really need a tip on how to make yourself eat chocolate every day, but, if you do, here you are…Eat dark chocolate regularly (but in moderation). Try making a snack mix with a combination of foods in this article including: pumpkin seeds, flaxseeds, almonds, and small pieces of dark chocolate. Heather Gilmore, LLMSW. Freelance Writer and Guest Blogger for Nielson Bio. Learn more about Heather at Google+. If you are also interested to write for HealthResource4u, Please check our guest posting guidelines at write for us.